I can see Muffie now, standing at my feet looking straight up at me with her pretty pink comb and wistful little face like a flower bud from the earth to which she returned. In this story I recount one of my earliest experiences with chickens, who I was just then getting to know, since I hadn’t grown up with them. I learned how a rooster can sometimes injure a hen under her wings when he pins her down for mating, and how important it is to check under the wings of any hen who is limping or listless, and separate her immediately from the rooster and treat any injury she may have with an antiseptic, to prevent an infection that, left untreated, can lead to death. I also learned about the susceptibility of domesticated hens to ovarian cancer as a result of being bred to lay too many eggs. And I learned about the elementary school practice of placing fertilized eggs in classroom incubators to be hatched as a lesson in avian embryology. This led to our continuing campaign, begun in 1994, to urge educators to replace bird-hatching projects with activities that teach life processes informatively and compassionately, without the use of live animals. Muffie and Fluffie were two young hens who came to live with us after being expelled from an elementary school hatching project. They were said to be sisters, and they certainly looked a lot alike with their pretty burnt-brown and white feathers and little pink combs. They settled easily into the chicken house surrounded by a tomato garden with Henry, our big white “broiler” rooster, and Henrietta, a young white leghorn hen who had been found along the road as a chick. Fluffie quickly established herself as the dominant hen for the first few weeks, while Muffie stood around listlessly. Soon, however, Muffie became as indefatigable a scratcher of the soil as Fluffie and Henrietta. It was a treat to watch the three eager young hens scratching vigorously among the red and green tomato plants with stolid Henry standing over them and following them up and down the leafy rows on his huge yellow legs. This happy time ended in the fall when Henry, who had great claws, gouged Henrietta’s sides in mounting her, the gouges became infected, and she died. When I saw similar wounds starting to show under Fluffie’s wings, and noticed how quiet she was becoming, I reluctantly separated her and Muffie from Henry by having a double enclosure built onto our kitchen. From then on, Henry and the two hens had to take turns being out in the yard. Fluffie’s wounds healed, but she never fully regained her liveliness, which seemed rather to pass into Muffie, who would often disappear in the woods for hours during the day, only to come charging over the grass at dusk on her sturdy legs, all bright-eyed, after I had called and called and feared she might have been killed. Along with her new independence, Muffie showed an increasing solicitude for Fluffie. They had always been close. In the early days, Muffie had expressed a certain deference toward Fluffie that now seemed to modify into her sense of Fluffie’s weakened condition. She and Fluffie often stood stock still together for long periods with their wings and little rosebud faces touching like two warm brown flowers growing side by side on the frosted lawn. One day, I looked out the kitchen window and saw Muffie straddled on top of Fluffie with her wings slightly extended over her against the side of our house. I called my husband to come take a look at this moving yet disturbing scene. We saw it repeated several times over the next few days. One afternoon when I went outside to put Muffie and Fluffie in for the night, I found them already in their house on the straw, Fluffie drooping with her head and tail curved toward the ground with Muffie motionless beside her. I took Fluffie to the doctor and brought her home with medicine, but she died that same night in the small bedroom where she and Muffie had sometimes liked to roost on top of the bookcase in front of the big window overlooking the yard. That is how Petal, our placid hen with the dusky sweeping wings, came to live with us. We adopted her from a sanctuary in Maryland. 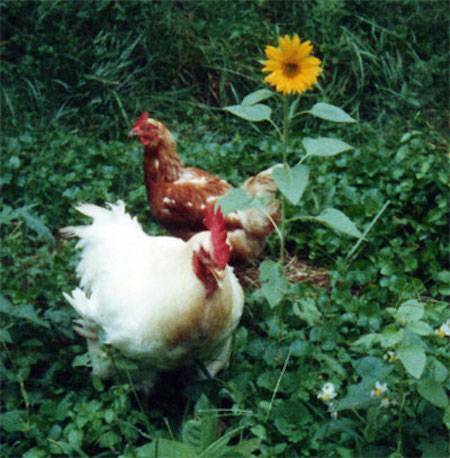 The minute Petal appeared on the scene Muffie lost all of her torpor and became a bustling “police miss,” picking on Petal and patrolling everything Petal did until, finally, the two hens became amiable, though never close the way Muffie and Fluffie had been. Muffie bonded in true friendship with our adopted turkey, Mila. Right from the start, Muffie and Mila hit it off, sharing a quiet bond of affection, foraging together and sometimes preening each other very delicately. One of their favorite rituals was in the evenings when I changed their water and ran the hose in their bowls. Together, Muffie and Mila would follow the tiny rivulets along the ground, drinking as they went, Muffie darting and drinking like a brisk brown fairy, Mila dreamily swaying and sipping, piping her intermittent flute notes. There were three roosters in Muffie’s life – Henry, with whom she socialized but was not particularly close, “gentleman” Jules, our sweet black bantam rooster who became her best pal, and Clarence, a fiery white and gold young fellow from a school hatching project in Michigan with fierce bangs sprouting over his eyes, who surveyed his fields like Napoleon and dodged the flock with his morsels like a football player with the ball. In A Streetcar Named Desire, playwright Tennessee Williams evokes the primal power and pride of Stanley Kowalski by comparing it to the power and pride of a “richly feathered male bird among hens.” This was Clarence, and Muffie became, in a way, his Blanch DuBois, trembling at the advances of the “gaudy seedbearer” whose fancy for her took the form of victorious chases through the yard. In the middle of her second winter with us, Muffie developed cancer and died. She had always been spry, perching on just about anything handy from the porch railing to the kitchen sink. She would fly up from a little wooden bench in the chicken house to get to her roost in the evenings. But a time came when she started sleeping on the bench itself. As Muffie’s flight muscles deteriorated, so did her confidence. One day, she was standing in the doorway when all of a sudden, Clarence appeared, gleaming, behind the screen. Muffie shrank, and in trying to escape, fluttered and fell over the ledge leading into the kitchen. A few days later, she was not on her bench, and I finally found her cold, still, and amazingly small, lying on the bare ground against the front of the house. I assumed she would die as I gently placed her on the bed where she had once laid many of her eggs so peacefully, but the next day she was padding about the house, somewhat chipper, eating and drinking. From then on until she died, Muffie lived in the house. She would have been happy to do so from the time, a year or so earlier, when she began sweetly perching on the sofa arm where I sat reading. 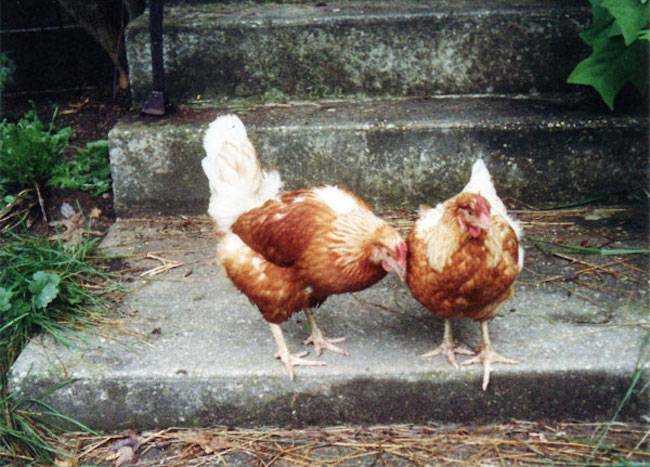 Chickens are naturally sociable, and will gather around a human companion and stand there serenely preening themselves or sit quietly on the ground beside someone they trust. Muffie not only did these things, but she also enjoyed being cuddled and held, the way some chickens do. I held Muffie a lot. Occasionally I would take her with me in the car, where at first she would always exercise her curiosity, looking out the window and poking about the seats and floor. Soon she would snuggle down next to me for the rest of the trip. To the end, she sat at my side, wherever we were, playing our favorite old game of closing our eyes, half opening and then closing them again. I can see her now, standing at my feet looking straight up at me with her pretty pink comb and wistful little face like a flower bud from the earth to which she returned.